Medium quality picture of Seljalandfoss waterfall. I have often wondered how many people visit Seljalandsfoss Waterfall each year. This is certainly one of Iceland´s most popular destinations and it has to be said that this is well deserved. The waterfall is some sixty meters high but the most fun part is that you can walk behind the waterfall.When doing this please take care as things are slippery and wet. When my daughter was a child she would demand that we went again and again behind the waterfall. We would do that round time and time again, laughing from the sheer coldness of the water spraying us. I don´t know how many photos I have from Seljalandsfoss or how often I have stopped there but I never get tired of it. It is an Icelandic classic if you will. A part from Hallgrímskirkja cathedral in the center of Reykjavik Seljalandsfoss is probably one of the most popular destination in Iceland. Many of the people visiting Seljalandsfoss waterfall are not aware of the beautiful waterfall of Gljúfrabúi which is just nearby. If you have the change, make sure you check it out. Seljalandfoss is one the great destinations on the Iceland south coast road trip plan that I created for you. It takes you all the way from Reykjavik to the fantastic Jokulsárlón Glacial Lagoon. It is easy to rent a car and drive the relatively short distance to Seljalandsfoss. 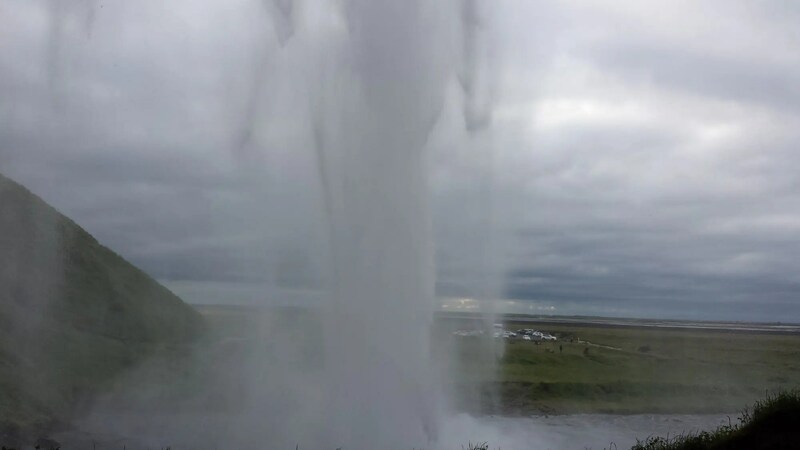 But you can also join one of join one of the many tours that feature Seljalandsfoss waterfall. Seljalandsfoss waterfall is close to several wonderful destinations and is one of the highlights on your south coast adventure. Nearby to the east of the waterfall are two noteable glaciers which both cover massive volcanoes. First it is Eyjafjallajökull which erupted back in 2010 and jettisoned such massive amounts of ash that air travel was severly disrupted. I saw the incredible plume and the just massive amount of material ejected when I volunteered a clean up effort during the eruption. Mýrdalsjökull glacier which covers the volcano Katla. It is the site where our friends of Katlatrack run their unique ice cave tours. Don´t worry, they know excactly what to do if Katla goes off. Also the east is the village of Vík and the famous black beach at Reynisfjara. To experience the beach, see the sea Reynisdrangar sea stacks and go up to the Dyrhólaey promontory is just essential if you are visting Iceland. One of Iceland´s most important historical sites is the turf house at Keldur. This farm used to be seat of important chieftains and their retainers during Iceland´s civil war called Sturlungaöld. Keldur has a pretty cool escape tunnel which is a telling relic of those troubled times. Take the bus or get an experienced guide to take you over. There are so many tours to this lovely area that you can join so getting there is not a problem. Which reminds me, I got to go there soon. There is a lot of selection of accommodation in the area. You will find all kinds of accommodation, farms, hotels and lodges. But please note that it is popular so we advice you to book well in advance. Use the search box below to find accomodation near this wonderful Icelandic classic of a waterfall. Want to discover more Icelandic waterfalls? Want more of waterfalls? Here are some really nice phototours of Icelandic Waterfalls and we have a pretty big section devoted to them. From Reykjavik drive on highway one to the south coast of Iceland (marked with “Vík) for just under two hours. You can´t miss it as it is clearly visible from the highway. Great Hiking Trail Near Reykjavik – if You Can Find it!